The Forbes 400 richest Americans regained lost ground in 2010, while most were still smarting from the recession. The total worth of the Forbes 400 was up 8% to $1.37 trillion, well out-earning the 1% rise in the S&P 500 index over the same period of time. More than half (217) are richer than they were a year ago. The headline number tells a partial story. Just over one-third of the 400 failed to add to their fortunes or lost ground. Still well out of reach is the record $1.57 trillion in total net worth set in 2008. But the very top of the list gained, as good friends Bill Gates and Warren Buffett added $4 billion and $5 billion, respectively. They, too, are short of their personal highs. Gates, who in March lost his title of world's richest person to Mexico's Carlos Slim, is still America's richest person -- for the 17th year in a row. Las Vegas gaming tycoon Sheldon Adelson was the kid, or "comeback adolescent," as he calls himself. "I'm too old to be a kid," he told Forbes. The largest shareholder of Las Vegas Sands is the year's biggest dollar gainer. His casino's shares are up 1,500% since their 2009 low. Adelson is now the 13th richest American, worth $14.7 billion, up $5.7 billion from last year -- though nowhere close to his $28 billion net worth in 2007, when he ranked third among Americans. The biggest gainer in percentage terms is Mark Zuckerberg, who more than tripled his fortune to $6.9 billion. The more conservative private valuation of Facebook is now around $23 billion; illiquid shares in the secondary markets point to an even richer valuation. Two of his cofounders are in the ranks for the first time: Eduardo Saverin and Dustin Moskovitz, both classmates of Zuckerberg's at Harvard. Moskovitz, who is eight days younger than Zuckerberg, now bragging rights as the world's youngest billionaire. The Facebook cofounders are among 16 newcomers on this year's list. Other notables include Dean Metropoulos, whose private equity firm recently bought Pabst Brewing; Terrence Pegula, who sold his Pennsylvania mining outfit to Royal Dutch Shell for $4.7 billion in May; and Elaine Wynn, whose divorce from casino magnate Steve Wynn was finalized in January. The price of admission to the 400 is back up to the $1 billion mark. Last year it was $950 million, the first time since 2005 it had fallen below 10 figures. The most notable of the 18 returnees is Ford Motor scion William Ford Sr., who made the cut after a four-year absence as the automobile company's stock hit five-year highs. Nine of the drop-offs fell off the list permanently. John Kluge passed away this summer. He was America's richest man from 1989 to 1991, before losing the title to Bill Gates. Yankees owner George Steinbrenner died in July just, after his 80th birthday. Our estimates of public fortunes are a snapshot of wealth on Aug. 25, 2010, the date we locked in net worths and rankings. We have not included dispersed fortunes (as in those of the DuPonts) when individual net worths are below our minimum. But we do include wealth belonging to a member's immediate relatives if the wealth can ultimately be traced to one living individual; in that case, "& family" indicates that the number shown includes money belonging to more than one person. 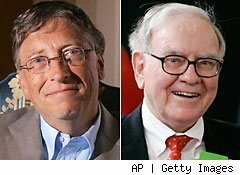 $54 billion | MIcrosoft | Medina, Wash.
$45 billion | Berkshire Hathaway | Omaha, Neb. $27 billion | Oracle | Woodside, Calif.
$24 billion | Wal-Mart | Jackson, Wyo. $21.5 billion | Manufacturing, Energy | New York, N.Y.
$20.1 billion | Wal-Mart | Bentonville, Ark. $20 billion | Wal-Mart | Bentonville, Ark. $18 billion | Bloomberg LP | New York, N.Y.
Click here to see the next richest American.